One of my favorite dessert, fresh PLUM TART. When plums were in season I made this dessert Saturday nights at our little French restaurant, Roxy's Bistro. I was always hoping to have left over pie for my Sunday breakfast. Use your favorite pastry recipe, or this simple and easy recipe from Robin Hood Flour. Measure the flour into mixing bowl; add salt and sugar and stir thoroughly. Cut in half of the lard with pastry blender or two knives until mixture looks like coarse meal; then remaining shortening until particles are the size of small peas. Sprinkle in water a little at a time, tossing mixture with a fork to mix well. Add only enough water to make dough hold together when pressed into a ball. Flatten the ball. Wrap in plastic wrap and chill for 15 to 30 minutes or longer. Roll out on a lightly-floured board or pastry cloth. Place the dough into a 9 inch flan tin with a removable bottom. Place dough in tin without stretching. and trim with scissors ½ inch from edge. Fold edge under and flute. Prick sides and bottom of crust with tines of fork. Bake blind for about 12 to 15 minutes or until the crust edges turns a light golden brown. Wash and pit plums, cut into fourths. Place in medium saucepan; add a tablespoon or so of water and cook over medium heat for 5 minutes. Combine cornstarch and a couple of tablespoons of water. 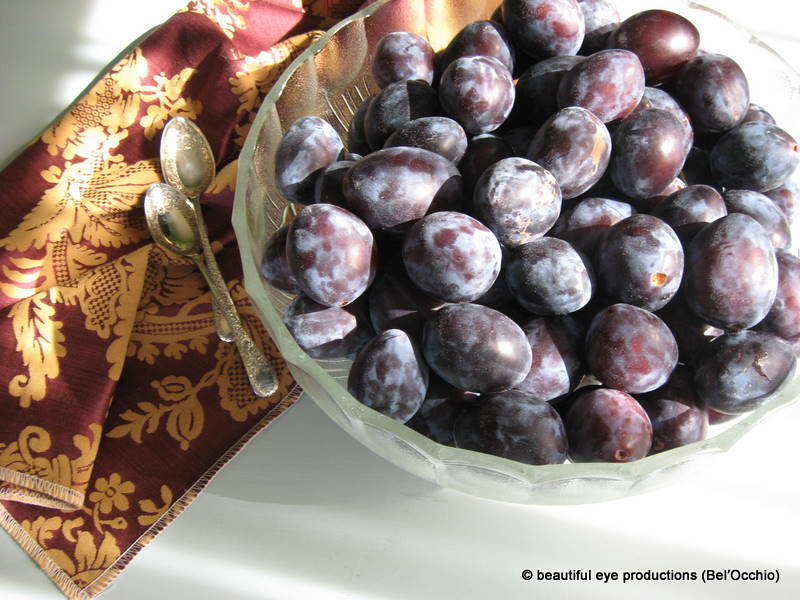 Stir into plums with granulated sugar. Continue cooking on medium heat just until the mixture starts to thicken, stirring gently but constantly. Remove from the heat; stir in butter and walnuts and let cool. Spread plum filling in pastry shell. Bake at 400 F. for 25 to 35 minutes or until pastry is golden brown. Cool slightly in the tin then sprinkle with powdered sugar. Remove flan from tin and serve warm. Chef's Notes: Even though the recipe calls for a single crust pie it is much easier to make a double crust amount. It is also easier to roll the double crust, because it gives you lots of lee-way for baking the crust.